This tart, rare flavor of agua fresca comes from Mexican skunkbush berries. When crushed, the leaves of Rhus trilobata give off a smell so intense it has earned the plant the nickname “skunkbush.” Despite its less-than-agreeable aroma, the people of Arandas, a city in the Mexican state of Jalisco, have been using its fruit, called agrillo, for centuries. The shrub, from the sumac family, produces hairy, sticky red berries. Edible and sour, they are the perfect fit for ice cream, popsicles, and agua fresca, a typical Mexican drink made of fruit, water, sugar, and a combination of flowers, cereals, and spices. Agua de agrillo, as this type of agua fresca is known, is a refreshingly tart drink served in Mexican restaurants and homes primarily in the early spring. 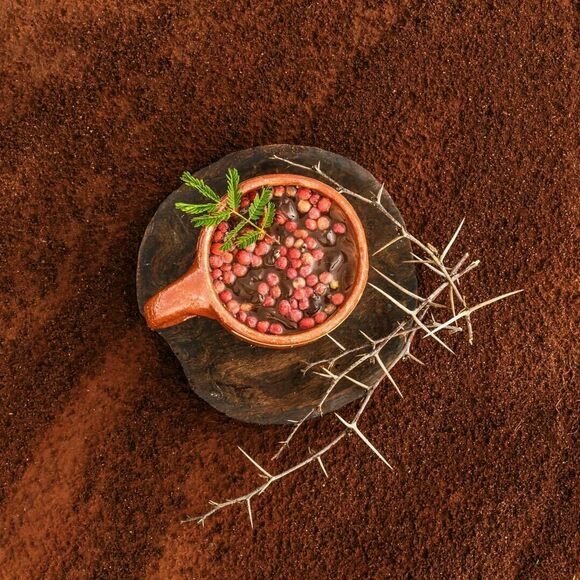 In the dry, mountainous area surrounding Arandas, the plant gives fruit only once a year, in late February or March, when temperatures begin to rise and the climate becomes more arid. Exports of agrillo-based products are low, making them unique cultural mainstays in the city. Since agrillo is difficult to come by when it’s not in season, plan a trip to Arandas around this time of year. Agua de agrillo is a welcome complement to the region’s famous carnitas and particular style of tacos al pastor. Agrillo berries grow in late February or March, so agua de agrillo will typically be available at the very beginning of spring. Though the skunkbush is native to the Western half of North America, from Canada to Mexico, you'll likely find agua de agrillo only in the area around Arandas.